Dr. Blanchet joined the Baylor faulty in 2012. Prior to coming to Baylor, he held faculty appointments at the State University of New York at Fredonia (2005-2012) and Louisiana State University Health Sciences Center (2002-2005). Dr. Blanchet is also a certified speech-language pathologist, as well as a person who stutters. Dr. Blanchet has taught courses in areas such as neuroscience, neurogenic communication disorders, fluency disorders, voice disorders, medical SLP, dysphagia, cleft palate, speech science, phonetics, research methods, and corporate speech pathology. 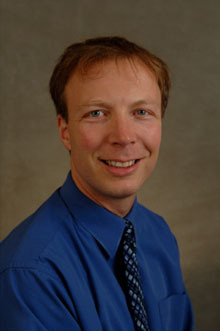 Dr. Blanchet’s primary areas of specialization are motor speech disorders and fluency disorders. His research interests include the effects of delayed auditory feedback (DAF) on speech production in individuals with Parkinson’s disease, and university students’ perceptions of speakers who stutter and/or clutter. Blanchet, P.G., & Snyder, G. (in press). Perceptions of cluttering among communication sciences and disorders and non-communication sciences and disorders students. Perspectives of the ASHA Special Interest Groups, 2 (SIG 4). Blanchet, P.G. (2017). Book review: Stuttering Meets Stereotype, Stigma, and Discrimination: An Overview of Attitude Research, K. St. Louis (Ed.). Journal of Fluency Disorders, 52, 65-68. Blanchet, P.G., Farrell, L.M., & Snyder, G. (2017). The effects of video exposure to cluttering on undergraduate students’ perceptions of a person who clutters. Perspectives of the ASHA Special Interest Groups, 2 (SIG 4), 28-40. doi: 10.1044/persp1.SIG4.28. Snyder, G., Waddell, D., & Blanchet, P. (2016). Mirror neurons as a model for the science and treatment of stuttering. NeuroReport, 27(1), 56-60. Blanchet, P., Farrell, L., Ambrosino, G., Paler, K. (2015). Survey of students’ identification of cluttering and stuttering. Procedia – Social and Behavioral Sciences, 193, 44-50. Blanchet, P. (2015). The apprentice: A model for mentoring students in research. Contemporary Issues in Communication Science and Disorders, 42, 26-32. Farrell, L.M., Blanchet, P.G., & Tillery, K.L. (2015). The effects of video exposure to cluttering on undergraduate students’ perceptions of a person who clutters. International Journal of Language and Communication Disorders, 50(3), 347-357. Manning, A. & Blanchet, P. (2014). Vocal mechanism knowledge and voice care among freshman and seniors university voice students. International Journal of Research in Choral Singing, 5(1), 60-77. Blanchet, P.G. (2014). Advancing graduate education in alaryngeal speech rehabilitation: Project AL. Contemporary Issues in Communication Science and Disorders, 41, 149-154. Cronin, S.A., Blanchet, P., Klonsky, B., Piazza, N. (2014). The effects of a simulated /r/ articulatory disorder on listener perceptions. Contemporary Issues in Communication Science and Disorders, 41, 169-178. Blanchet, P. (2014, February). Differential diagnosis of the dysarthrias using an ELMS analysis. SpeechPathology.com, Article 2321. Retrieved from: http://www.speechpathology.com. Blanchet, P. & Snyder, G. (2010). Speech rate treatments for individuals with dysarthria: A tutorial. Perceptual and Motor Skills, 110(3), 965-982. Specht, N. & Blanchet, P. (2009). A survey of corporate speech pathologists' demographic characteristics, professional activities, and career satisfaction. Contemporary Issues in Communication Sciences & Disorders, 36, 118-132. Lake, T. P., Blanchet, P. G., Levonyan Radloff, T., & Klonsky, B. G. (2009). Undergraduate and graduate students’ perceptions of an instructor who stutters. Contemporary Issues in Communication Science and Disorders, 36, 26–35. Blanchet, P. & Snyder, G. (2009). Speech rate deficits in individuals with Parkinson’s disease: A review of the literature. Journal of Medical Speech-Language Pathology, 17(1), 1-7. Snyder, G., Strauss-Hough, M., Waddell, D., & Blanchet, P. (2009). The effects of self-generated synchronous and asynchronous visual speech feedback on overt stuttering frequency. Journal of Communication Disorders, 42(3), 235-244. Snyder, Blanchet, Waddell, & Ivy (2009). Effects of digital vibrotactile speech feedback on overt stuttering frequency. Perceptual and Motor Skills, 108, 271-280. Blanchet, P. & Snyder, G. (2017, September). The effects of factual and apologetic modes of self-disclosure on university students’ perceptions of a speaker who stutters. Poster session presented at the 11th Oxford Dysfluency Conference, St. Catherine’s College, Oxford, UK. Blanchet, P. & Snyder, G. (2017, September). The effects of self-disclosure versus other-mediated disclosure on university students’ perceptions of a speaker who stutters. Poster session presented at the 11th Oxford Dysfluency Conference, St. Catherine’s College, Oxford, UK. Blanchet, P., Levonyan-Radloff, T., Lake, T., Klonsky, B., & Butler, B. (2014, July). Students’ perceptions of a speaker who stutters under disclosure and non-disclosure conditions. Poster session presented at the 10th Oxford Dysfluency Conference, St. Catherine’s College, Oxford, UK. Blanchet, P., Farrell, L., Ambrosino, G., Paler, K. (2014, July). Identification of cluttering and stuttering among university students. Poster session presented at the 10th Oxford Dysfluency Conference, St. Catherine’s College, Oxford, UK. Blanchet, P., Levonyan-Radloff, T., Lake, T., Klonsky, B., & Butler, B. (2011, September). Students’ perceptions of a speaker who stutters in disfluent and fluent conditions. Poster session presented at the 9th Oxford Dysfluency Conference, St. Catherine’s College, Oxford, UK. Blanchet, P. G. (2010, December). Factors influencing the efficacy of delayed auditory feedback in treating dysarthric speech associated with Parkinson's disease. Poster session presented at the 7th International Congress on Mental Dysfunctions & Other Non-Motor Features in Parkinson's Disease & Related Disorders, Barcelona, Spain. Farrell, L., Blanchet, P., Tillery, K. (2016, November). The effects of video exposure on undergraduate students' perceptions of a person who clutters. Poster session conducted at the annual convention of the American Speech-Language-Hearing Association, Philadelphia, PA.
Blanchet, P. (2015, November). The ELMS analysis: A tool to aid in differential diagnosis of pure and mixed dysarthrias. Seminar conducted at the annual convention of the American Speech-Language-Hearing Association, Denver, CO.
Blanchet, P., Levonyan-Radloff, T., Lake, T., Klonsky, B., & Butler, B. (2015, November). The effects of self-closure on students’ perceptions of a speaker who stutters. Poster session conducted at the annual convention of the American Speech-Language-Hearing Association, Denver, CO.
Blanchet, P., Farrell, L., Ambrosino, G., Paler, K. (2015, November). Survey of students’ identification of cluttering and stuttering. Poster session conducted at the annual convention of the American Speech-Language-Hearing Association, Denver, CO.
Blanchet, P. (2013, November). Differential diagnosis of the dysarthrias using the ELMS model. Technical session conducted at the annual convention of the American Speech-Language-Hearing Association, Chicago. Blanchet, P. (2013, November). Advancing graduate education in medical speech-language pathology: Project AL. Technical session conducted at the annual convention of the American Speech-Language-Hearing Association, Chicago. Manning, A. & Blanchet, P. (2013, November). Knowledge and awareness levels of the vocal mechanism and care among university voice majors. Poster session conducted at the annual convention of the American Speech-Language-Hearing Association, Chicago. Blanchet, P. (2010, November). The apprentice: A model for mentoring students in research. Technical/platform session presented at the annual convention of the American Speech-Language-Hearing Association, Philadelphia, PA.
Blanchet, P., Levonyan-Radloff, T., Lake, T., Klonsky, B., & Butler, B. (2010, November). Students’ perceptions of a speaker in disfluent and fluent conditions. Poster session presented at the annual convention of the American Speech-Language-Hearing Association, Philadelphia, PA.
Snyder, G., Hirt, H. & Blanchet, P. (2009, November). Distinctive features of enhanced fluency induced by tactile speech feedback. Poster session presented at the annual convention of the American Speech-Language-Hearing Association, New Orleans, LA. Blanchet, P. (2007, November). Factors influencing the efficacy of delayed auditory feedback in treating dysarthric speech associated with Parkinson's disease. Technical/platform session presented at the annual convention of the American Speech-Language-Hearing Association, Boston, MA. Blanchet, P. G. (2006, November). Factors influencing the efficacy of delayed auditory feedback in treating dysarthric speech associated with Parkinson's disease. Poster session presented at the annual convention of the American Speech-Language-Hearing Association, Miami, FL. Norris, J. A., Healey, E. C., Hoffman, P. R., Blanchet, P. G., Kaufman, E. & Scott-Trautman, L. (1998, November). Approaching fluency therapy from a multifactorial perspective: A changing view. Paper presented at the convention of the American Speech and Hearing Association, San Antonio, TX.